Yesterday, Neil Flynn became our first Celebrity champion. Who will join him: Aaron Rodgers, Kevin O’Leary, or Mark Kelly? I predicted that Aaron would take this one down, and that Kevin would be lying belly up. Looks pretty good so far. Some mind games between Aaron and Mark. If Mark doubles his score, he’ll have 17,200. To cover this all-in wager, Aaron will need to wager 4,400. An incorrect response with that wager will leave Aaron with 8,400. To stay above his total, Mark can wager up to 200. 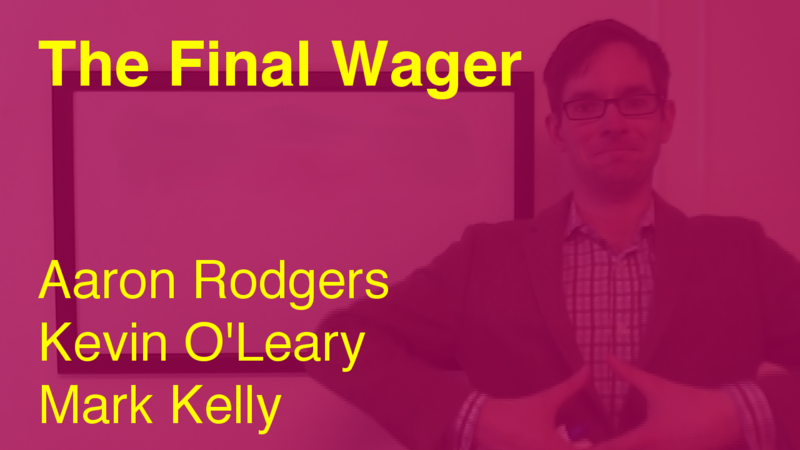 If Mark makes the rational maximum wager of 200, Aaron will need to wager no more than 4,000 to stay above him. In that case, Mark would have to wager 8,200 and respond correctly. All in for charity! Had both Mark and Aaron gotten it right, Mark would have left $4,300 on the table for charity. No point in doing that, particularly when second and third get the same amount! Who are William S. Harley and Arthur Davidson?